Table height: 37". Angle adjustment from horizontal (0°) to 45°. The legs are welded together to form a 3" x 2" post for maximum strength, stability, and rigidity. All metal parts are scratch resistant, electro-static powder coated. 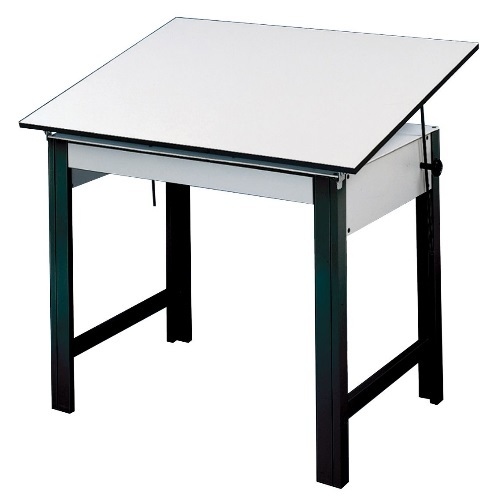 Tabletop board and supporting panels are made of ¾" therma-fuse Melamine. Surface is smooth, durable, white matte Melamine, trimmed with bonded black vinyl edges. Does not include drawers. All bases are equipped with built-in fittings for the purchase of the two drawers if not bought originally. Top Size: 37.5" x 60"